JK: Summarized in the book of drawings, the selection published in 1966. You have always taught drawing, and you’re well-known for the quality of your drawing: that’s been noticed from the earliest exhibition. What do you try to convey to students about drawing? WB: I could think that in the 15th century a young person would come and say, “I want to learn to draw,” and that a master could answer, “Yes, this is what drawing is, these are the skills you will require, there are the subjects you will deal with.” But today we have the whole precedent of art as a point of departure, as a basis of what drawing has been. We don’t have such a specific idea of what drawing can be. Certainly I do not, nor do I have a clear idea of where one begins. JK: Drawing is something you do regularly though. WB: It’s a continuous activity for me. I think increasingly I feel that I want to act upon any idea or image that passes through my mind. I want to grasp it, to mark it. I also find that one drawing begets another, and the idea develops. I rarely use a drawing as a direct study for a painting. The drawings have a life of their own. They establish a vocabulary that I develop in painting. So the drawings coexist. They are interactive. I think, because of their immediacy, because of the simplicity of the medium, the process, they are of a different nature than the paintings. One of the fascinations of drawing is that all one needs is something with which to make a mark. It’s the absence of paraphernalia. It’s significant that some of the most moving works are achieved in drawing. JK: So, drawing is a basic activity? WB: I don’t know if I would put drawing first. Perhaps in the sense that Ingres speaks of it as the probity of art. JK: How does it relate to painting? WB: Matisse said, I think, that you could tell a colorist in his drawings. That’s certainly true of Matisse, but what impresses me is that in his most economic line drawings there is such fullness of expression. Whatever the subject – the line is able in one thin thread to convey so much sensation, so much feeling. Of course, his drawings are generally environmental. But much drawing is fragment, notation. JK: Perhaps painting has a public aspect, while drawing remains private? WB: In much of the past drawings were considered to be preparations, studies, cartoons. The later appreciations have led us to them. In the 20th century, we will often prefer the drawing to the finished painting. In a way we’re interested in artists to the degree that they reveal or bring us close to the creative process. JK: And if we’re looking at the work of an artist like yourself, who has always made drawings, then the process means really the evolution of the artist himself. So, in the drawings from 1958 on…? WB: Perhaps I began to see that as I worked on these drawings, it was really a state of feeling that dictated the character of the drawing. JK: Feeling about the subject, the model…? WB: Most of these drawings were not actually done in the presence of the model. JK: So, they’re not notations. JK: The well runs dry. WB: Right. It’s all one’s own presence. But not one’s presence enriched or provoked into a new condition of feeling. JK: You want reality, though not too much of it. WB: Interesting that you bring this up. Because, as I look at my work over the years, I think one thing’s clear: I’ve always been interested in the associative, but representation of external reality has not been central. 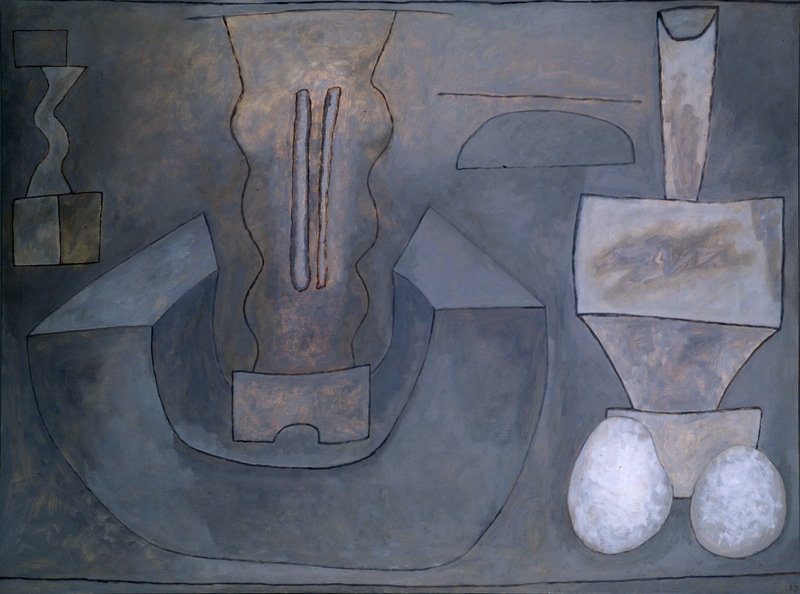 Untitled, 1978, Oil on canvas, 72 X 96 in. a new case for discussion, almost as though the critics and curators were inventing what we will see rather than the artists. Or, that the young artist has to make a mark with some wholly novel discovery in optics or metaphysics at the outset of a career. You’ve felt that effect or pressure like everyone else? WB: We are always working in a changing context. At various times there have been certain artists whose work was of passionate interest to me. JK: But you never intend to make comments in your art. Would you say your attention to history comes from the fact that you’ve regularly taught in an art department for the past 30 years? WB: Certainly that’s contributed. I am aware of the sequence of reactions to critical movements since the 50’s in this country, especially because in teaching you see that every few years a new group of students undergo their, if you like, artistic birth in a new climate and see new icons before them. It’s a central problem for a young artist – coming to the birth of consciousness and having right off to deal with the art that’s riding the crest of enthusiasm, vigorously asserting its dominance. It’s not just a question of being, let’s say, in the New York region, or the South, or in Boston or on the West Coast. The student is facing the icons appearing and manifesting their power internationally. I’ve noticed that in most art schools or university art departments you find in the graduate exhibitions every few years attitudes reflecting the current vogue or movement. It is not so much that the artist has the responsibility of expressing his time, he can’t escape his time. These generations of young artists take on the responsibility of their own expression in the context of the entire precedent of art, but most particularly in regard to the heat of the moment. JK: And of the market, too. WB: Exactly. At the time of the emergence of Frank Stella, for example, there was a near euphoria among students about the possibility of a young artist’s establishing an international reputation almost instantaneously. There was the idea that you could really make the scene. But there was, I think, considerable disenchantment with this idea within five or six years and with the disenchantment came alternatives to the museum-gallery situation.